Nintendo has a long history of building innovative game controllers -- the company put shoulder buttons on the SNES gamepad, added force feedback to the N64's bizarre controller and made a fad out of motion controls with the Wii. Its most enduring innovation, however, has always been the humble D-Pad: a simple plastic cross that lets players input eight different direction inputs with precision and ease. Strangely, however, this iconic control pad was left out of the Nintendo Switch's default controller design, and I miss it every time I play the system. So, I did what any reasonable tech blogger would do: I used a 3D printer to make my own Nintendo Switch D-pad. Okay, "make" might be a bit of an overstatement -- I didn't personally design or print anything -- but when a friend of mine asked if I wanted to run anything through his new magic 3D fabrication machine, I knew exactly what I wanted. 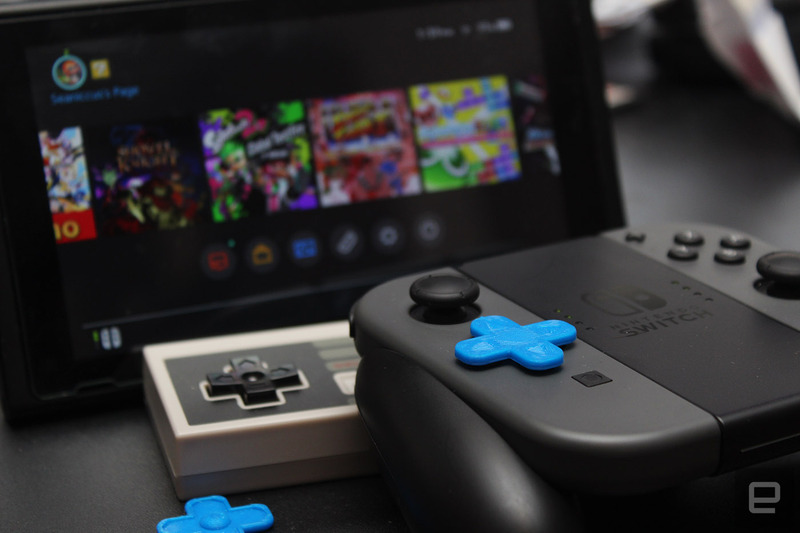 Just days after Nintendo's January Switch reveal, Thingiverse user EmperorFaiz uploaded the Nintendo Switch D-Pad Mod -- a DIY plastic cross that fits over the left Joy-con's separated directional buttons. I had absolutely no confidence a homemade, stick-on accessory could make the Switch controller feel more like a traditional gamepad, but I also had nothing to lose: My buddy told me the file would take less than ten minutes to print up and cost less than 30 cents. So, I had him make one. And it worked. It worked really well. 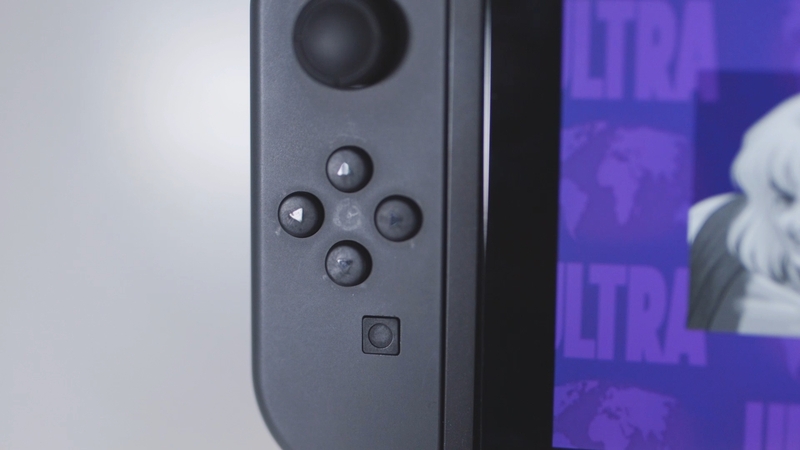 The DIY D-pad won't stay attached to the Switch's Joy-con without a dab of mounting putty or sticky tape, but once it's installed, it feels almost exactly like a traditional D-pad. I used it to break lines of falling blocks in Puyo Puyo Tetris, take out flying rats in Shovel Knight and explore the depths of the underworld in Blaster Master Zero. It felt natural, and after a few minutes of play, I forgot it was there. That's probably because EmperorFaiz's accessory works on the same principal as Nintendo's original patent: balancing the arms of the control pad's cross over four physical inputs and smoothly pivoting on a ball at the pad's center. The inputs the pad presses are the exterior buttons instead of interior toggles, but if the accessory is properly placed on the Switch controller, it doesn't matter. 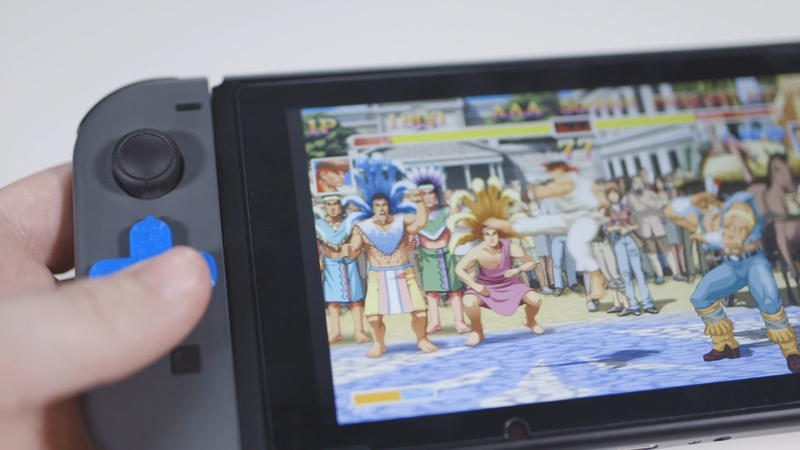 It still works -- well enough to consistently pull off special moves in Ultra Street Fighter II: The Final Challengers, at least. As much as the DIY accessory made me wish the Switch shipped with an official D-pad solution, I understand why it doesn't. Eliminating the traditional input allowed Nintendo to make the two Joy-con controllers more or less symmetrical when held sideways -- which makes it possible to split them up to use as separate controllers for multiplayer gaming. Giving the left Joy-con traditional directional buttons would have crippled it as a standalone controller. As an easily removable mod, EmperorFaiz homemade accessory seems like the perfect solution. Unfortunately, it's not. The DIY D-pad is well designed, easy to install and a complete joy to use -- but using it on a regular basis might damage your console. After about a week of use, my console started showing scuff marks where the edges of the cross touched the Joy-con's plastic front, and the outline of a circle was now visible where the accessory had been pivoting between the controller's face buttons. These friction marks are minor, for now, but it's possible these scrapes could develop into deeper scars with further use. For me, the scuffs on my Joy-con are a deal-breaker, but if you don't mind having a little wear on your controllers or happen to have a spare set, EmperorFaiz's D-pad design is a fun, geeky solution for one of the Switch's minor problems. It's not as nice as Nintendo's official Pro Controller, or even the 8Bitdo bluetooth gamepads -- but if you have access to a 3D printer it's by far the cheapest way give your Nintendo Switch that classic retro-controller feel.